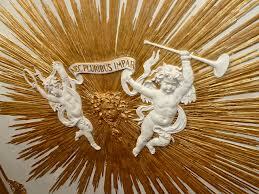 Ludwig II of Bavaria identified with Louis XIV, the Sun King of France. (In German, Ludwig is the same name as Louis). 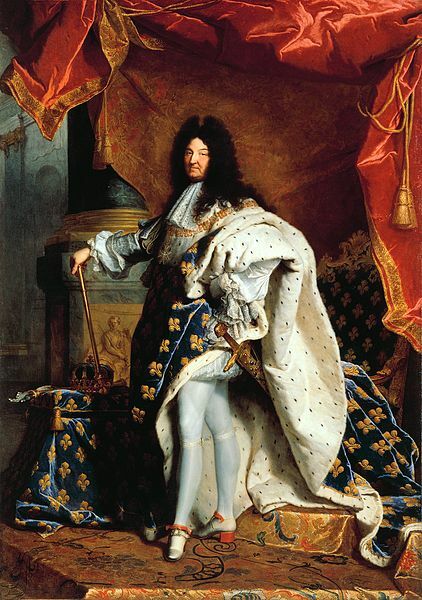 The trouble was, the French King Louis XIV actually was an absolute monarch who expanded and presided over quite a large and powerful empire. Louis XIV was also a warrior. He actually led his own forces in the battlefield. Ludwig? Not so much. And he had little interest in the day-to-day work of government. 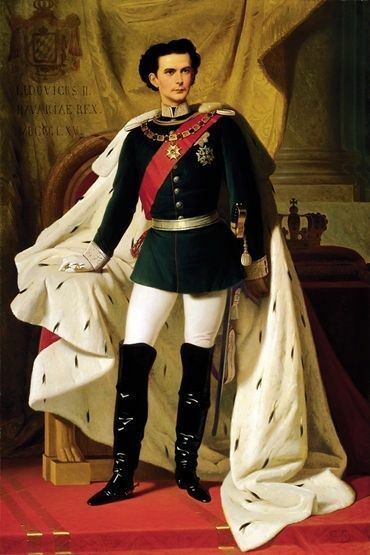 Ludwig was a monarch of the kingdom of Bavaria, which was much smaller and less powerful than France. Through no real fault of Ludwig’s, Bavaria was more or less eaten up by Germany, under Kaiser Wilhelm I of Prussia, during his reign. But while Bavarian independence lasted, Ludwig was a much-loved monarch of a proud independent kingdom. 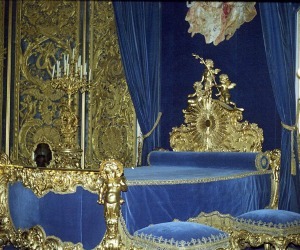 He visited Versailles early in his reign. When he came home, he decided to build a dream home–or maybe two or three or four dream homes. Linderhof Palace, where he actually spent a lot of time, was designed as a mini-Versailles-for-one. It is in French Rococo style and has any number of references to the Sun King, including this ceiling medallion in the main entry. But Ludwig called himself the Moon King. He often stayed up all night and slept all day. He was fond of moonlit sleighrides. Pulled by four white horses, he rode in solitary splendor, enjoying the spectacular Bavarian landscape of mountains, foothills and farms. During these forays into the countryside, he would often stop and visit with the locals, who adored him. His life was lonely, but by all accounts at least some of his servants and a few of his peers became loyal and trusted friends. The movie Ludwig, directed by Luchino Visconti, touchingly describes some of these friendships, which lasted to the untimely end of Ludwig’s life. 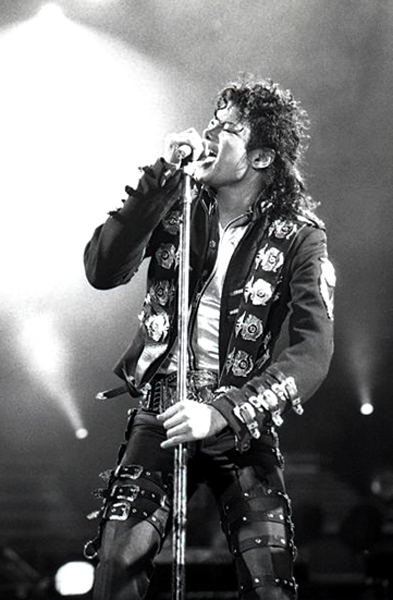 If I had to make a modern comparison, I would compare Ludwig IV to Michael Jackson. I would not want to offend fans of either man by carrying the comparison too far. But both of them were romantic, idealistic, talented, misunderstood, and wildly famous but still lonely. Both of them died far too early in mysterious circumstances. And both died accompanied only by their physicians. Sometimes the past can help us understand the present. This entry was posted in Austria, Castles and Palaces, Explore Europe, Germany, Historical Figures, History, Ludwig's Castles, Vienna, Why I Love Vienna and tagged Linderhof Palace, Louis XIV, Ludwig II, Michael Jackson, Moon King, Sun King on April 30, 2013 by Claudia Suzan Carley. Last fall I was finally able to visit Linderhof Palace, King Ludwig II’s favorite home, at a time when the grotto was open. I was anxious to see it, especially after watching Luchino Visconti’s very fine film Ludwig, about the life and mysterious death of the notorious Bavarian king. 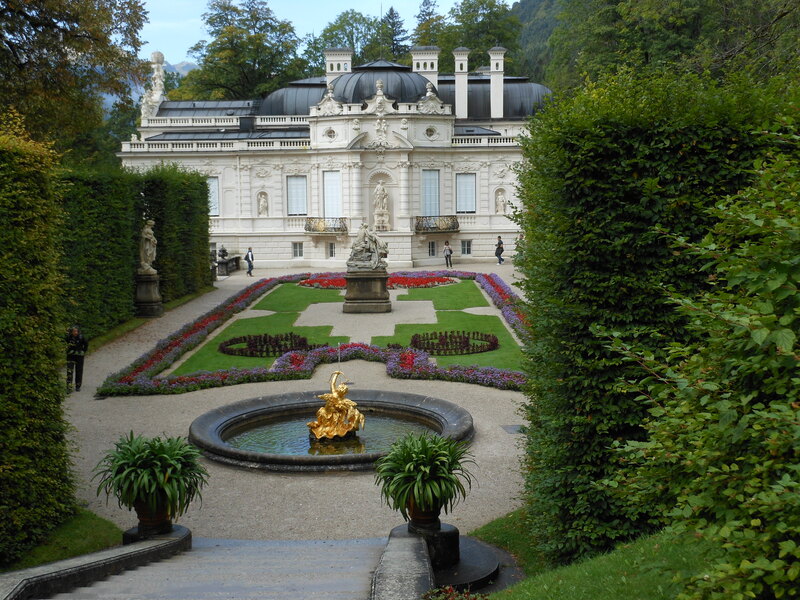 Ludwig built Linderhof as his own personal getaway. In fact, it was the ultimate bachelor pad. But he enjoyed the place in solitary splendor; he rarely if ever had visitors. He built a special music room for his favorite composer, Richard Wagner, but Wagner never saw it. The grounds are breathtaking, and because the palace is quite small, each room looks out onto a beautiful manicured view with pristine mountains in the background. 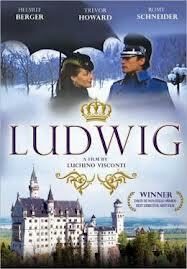 In Visconti’s 1972 film Ludwig, the king is played by Visconti’s real-life romantic partner and muse, Helmut Berger. It is hard to say how accurate the life story is. But it is certain that Ludwig was an eccentric and dreamy romantic. His people loved him, but he was not much of a king when it was time to hang the ermine in the closet and get some work done. One of Ludwig’s very few friends was his cousin, the Austrian Empress Elisabeth, nicknamed Sisi. She was famously married to the Emperor when she was only 15, and spent the rest of her life wanting out. She is played by Romy Schneider (who also played Sisi in the very silly but entertaining semi-fictional series of Sissi movies). The grotto was built up the hill behind the castle. The entrance looks like a fort a very ambitious child might build. 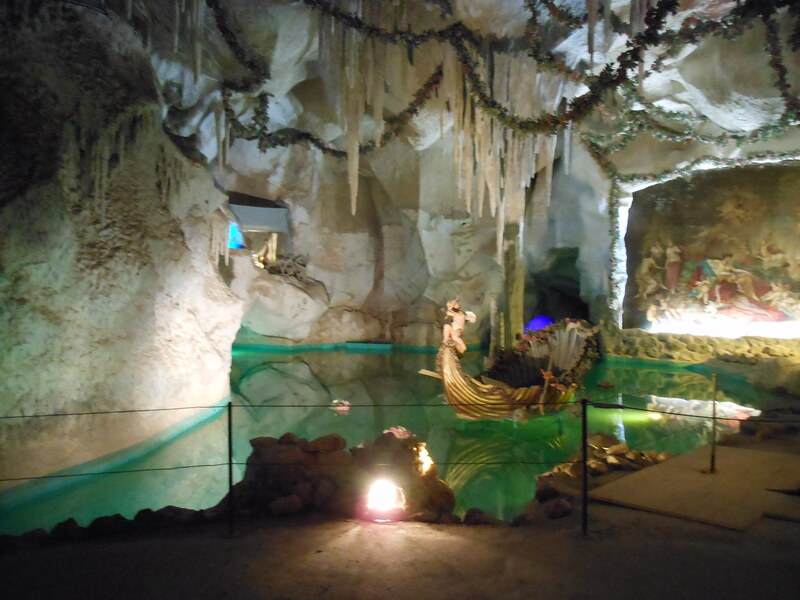 But the grotto itself is as jaw-droppingly weird and beautiful as it was in Ludwig’s day. He had Wagner’s operas performed inside for his own personal pleasure. The water was heated, so that he could swim in it if he tired of being rowed around in his gilded shell boat. And the lighting could change colors depending on his mood, or the mood of the opera scene. The grotto is still festooned with the floral swags that Visconti’s movie crew put up. 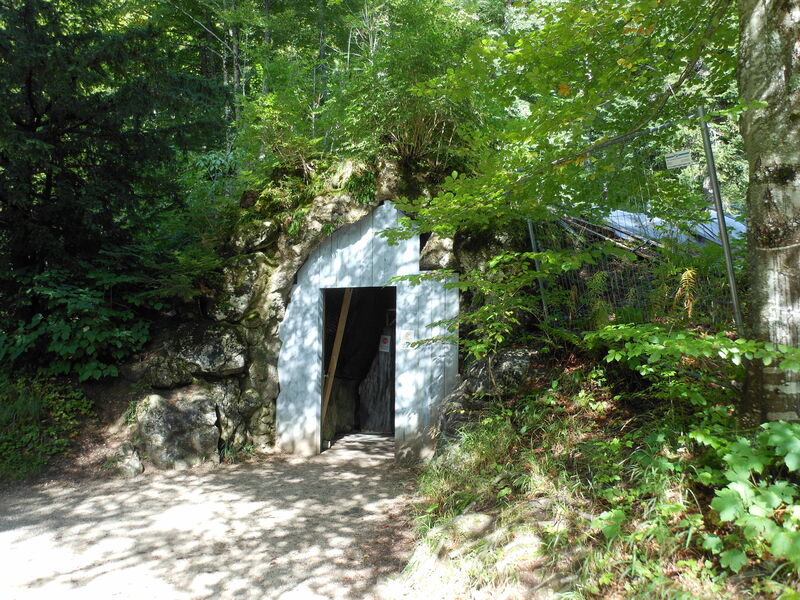 The film has a fantastic scene where an Austrian actor is taken into the grotto to meet Ludwig, who wants him to recite dramatic speeches 24/7. Helmut Berger, as Ludwig, floats out of the gloom in his shell boat, wearing a dark overcoat and a black Homburg–with an enormous diamond brooch pinned to the side. He fixes the actor with an imperious, piercing stare. The actor tries hard to be Ludwig’s New Best Friend, but the friendship ends badly and Ludwig is alone again. Nearby Neuschwanstein and Hohenschwangau Castles are justly famous, but they are overrun with tourists. Armed with a Bavarian Castles Pass, I actually went to Linderhof twice during my last trip. One day it was rainy, the next it was sunny. I can’t say I had the place to myself, but there was time and space enough to ponder the mysterious life of Ludwig. This entry was posted in Art, Castles and Palaces, Explore Europe, Germany, Historic Homes, Historical Figures, History, Ludwig's Castles and tagged Empress Elizabeth, Helmut Berger, Linderhof, Luchino Visconti, Ludwig film, Ludwig II, Ludwig's grotto at Linderhof, Romy Schneider, Sisi on April 26, 2013 by Claudia Suzan Carley.